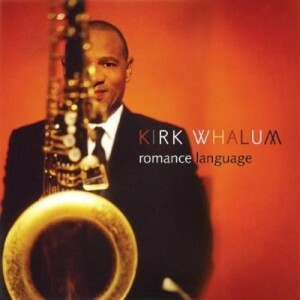 While Kirk Whalum’s latest project, Romance Language, is romantic sax music of the highest caliber, it is much, much more than that. It is a tribute to the late jazz giant, John Coltrane. Those who are familiar with the music of both saxophonists might be perplexed at the thought of such a tribute. Aside from the fact that both artists can be viewed as having a mind toward spiritual things, they have almost nothing in common beyond the saxophone. Whalum’s music is infused with the melodic, smooth jazz sensibilities of pop and R&B; Coltrane, on the other hand, was a colossal improvisationalist, whose music stretched the boundaries of jazz. The first six songs of Romance Language are re-interpretations of the simply-titled 1963 album, John Coltrane and Johnny Hartman. The original recording, one of Coltrane’s most accessible works, featured the rhythm section from his 1960s quartet (pianist McCoy Tyner, bassist Jimmy Garrison, and drummer Elvin Jones) and a collection of ballads penned by Irving Berlin, Billy Strayhorn, and Rodgers and Hart. Johnny Hartman was apparently Coltrane’s suggestion, and his deep, dark voice blends beautifully with Coltrane’s tenor. As he contemplated doing this tribute, Whalum knew from the beginning that he wanted to include his brother, Kevin, on vocals. It is remarkable to listen to the recordings side by side and compare the sound of the two voices. While the vocal qualities and stylings are different, both express the same vulnerability, and both have beautiful tone and pitch. Thirty minutes of music might be considered generous by 1960s LP standards; however, contemporary audiences expect 45 to 50 minutes of music on a full-length CD. So, how did Whalum decide on the additional tunes? No doubt, that must have weighed heavily on his mind. How does one juxtapose four untried songs and six classics? Whalum discloses that he had to sit down, look in a mirror, and tell himself, “Okay, you gotta step out there, put your heart on your sleeve, and say, ‘These songs are important to me.’” It’s not a decision I would have wanted to make, but the resulting compilation has an empathetic quality that I believe people will notice right away. Whether you are looking to pick up some romantic sax music for that candlelight dinner for two, or merely craving to hear something a bit different in the smooth jazz genre, you cannot go wrong with Romance Language. And, if you are not already a fan of John Coltrane, I hope Whalum’s tribute encourages you to become familiar with the original recording, John Coltrane and Johnny Hartman. It is beautiful music. If you’d like to receive some free smooth jazz downloads, please enter your name and email address in the boxes at the upper right of this page. Mobile users, click HERE. I cοulԁ not гesіst cοmmenting.